Momentum lost for my art and my blog has been found. Hurray! And here's the proof! Digital drawing picked up speed in my work in 2013. I sampled a pile of different apps on my iPad along with the usual suspects on my laptop through a gorgeous, but sadly not my own, Cintiq 24 HD tablet. I was enjoying the digital drawing so much that I began my annual holiday card using the ProCreation app on the iPad. Happily, this drawing app is following a groovy trend toward allowing the artist to playback their drawing stroke by stroke... presto, animation-o. I thought it would be fun to play back the evolution of my holiday card and it kind of is. Two problems/distractions brought this experiment to a premature end. Depending on the canvas size you choose from pre-set standards or your own custom canvas size, the app adjusts the number of layers available to manipulate. I had twelve layers. Twelve whole layers. 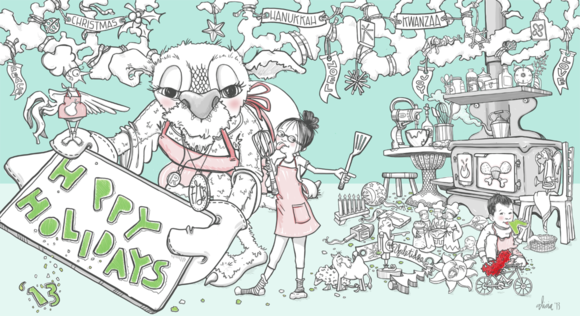 You may notice that my holiday card includes a medium to mildy crazy level of detail/clutter. Mildy crazy and twelve don't work together nicely for very long. On to distraction and drawing board number two. I gifted myself with a very groovy and essential drawing board, the Cintiq 13HD tablet. Had to! It arrive in the mail about where this video ends. I had to use it immediately. A perfect opportunity to escape my frustration over the twelve which is just what I did. Thanks, I believe, to my two drawing boards I'm very happy with this year's card.